During the workshop the shop will be closed to the public. The workshop will start out with a short history on Hooking that originated in the Maritime Provinces of Canada and the North Eastern United States. You will also be given information on all aspects of the craft. Each participant will receive their own kit to keep with all the supplies needed that consists of materials and tools to complete a sample mat, including a proper handmade Rug Hook, Wool Fabric for strips, and various miscellaneous. Students should bring their own sharp scissors. During the class you will also have use of your own individual frame. In this workshop you will learn everything you need to know about the craft, including finishing. Several examples both antique and modern will be on display. Ms. Davis will be demonstrating as well as giving individual attention. During a short break we will have coffee, tea and cookies. Shopping table too! 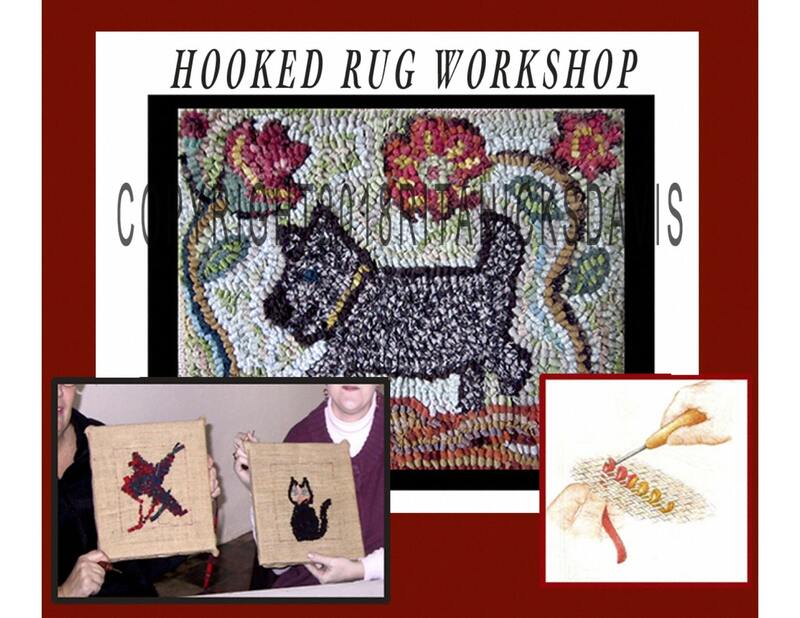 The popularity of Rug Hooking has made its way down to the Midwest and has found it’s own following amongst knitters, quilter’s and crafters both female and male alike. Great winter pastime too! We always have lots of fun!